And then also to use Spellbinder dies as well, of course, JustRite stamps and/or dies. In my card I used several Spellbinder dies as well as a few JustRite dies that coordinated with the JustRite Stamp set that I chose. I LOVE it when dies coordinate with stamps....such a nice clean look without any extra fussy cutting! I actually hope to try and get another entry into this challenge before it expires.....now that I have the colors worked out in my mind! And, as always, thanks for stopping by! Aww! Love all the layers! Oh my word! This is a beauty!! What a lovely card! Simply gorgeous Sheila. You are the Queen of Die cuts. Beautiful colours and die work, Sheila! Your card design is fabulous! You really have such a way of layering dies that always works Sheila! 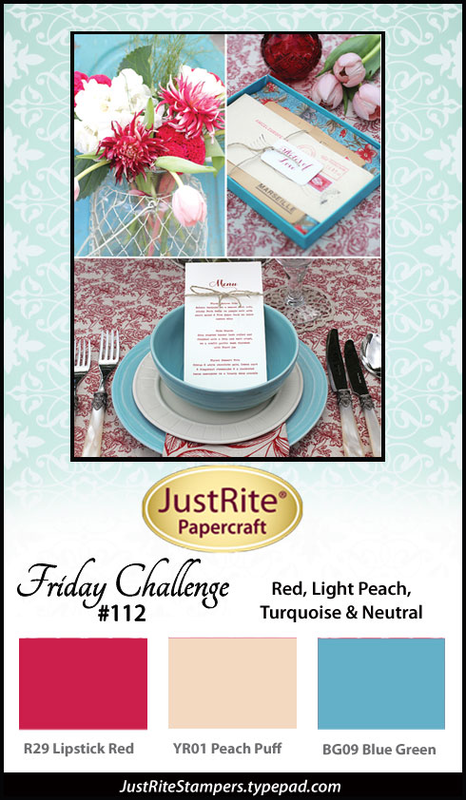 And I think the way you tied the challenge colors together is fabulous! Hi Sheila! Your card is SO lovely!! I love how you used the dies, the layers look beautiful. The little bow and rosettes corner is gorgeous. Great card!! Your card is just lovely. I particularly like how you mixed your dies to such great effect. Well done. Your card is beautiful! I also had some trouble at first with that colour combo, and was surprised by just how pretty it is. I love the red as your main colour and how you worked in the blue with the patterned paper. the layers are fabulous! Beautiful layers! Love the touch of floral background paper!!! What a GORGEOUS card, Shelia. I hadn't looked close up @ any entries, so just realized we used the same stamps! 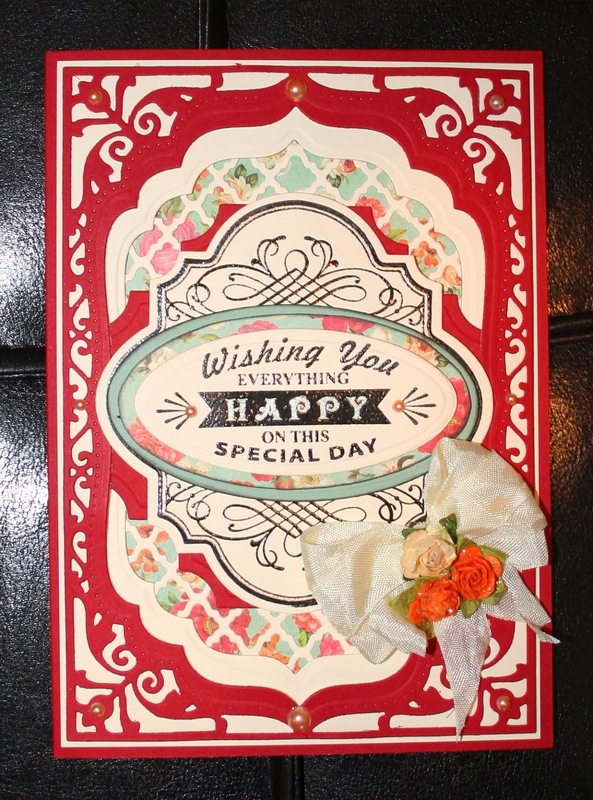 So fun to see different ways they can be showcased -- your card has such fabulous layering of dies and papers -- LOVE it! Thanks for your sweet comment too!